The retirement of Rep. Tom Petri (R, WI-6) means that 41 members of the House are leaving the lower chamber at the end of this Congress in order to either exit public life or run for another office. There are clear governing implications for these retirements: For instance, several of the retiring members, like Reps. Dave Camp (R, MI-4), Buck McKeon (R, CA-25) and Mike Rogers (R, MI-8), are committee chairmen. But in a political sense, relatively few of the retirements have created true opportunities for partisan turnover in November. To demonstrate this, we looked at what are essentially the 100 most competitive seats in the House, at least on paper: The 50 Democratic-held seats where Mitt Romney did the best in 2012, and the 50 Republican-held seats where President Obama did the best. Of the 50 Democratic seats, just six are now open because the incumbent is retiring or running for another office; of the 50 Republican ones, just eight are open. The retiring Petri’s district just barely makes the list at No. 50. The following two tables show the retiring Democrats and Republicans who currently occupy one of these 100 competitive seats. Note: *Districts are ranked in order of how well the opposite party’s presidential candidate performed in the district in 2012. So, for instance, President Obama’s best Republican-held district in 2012 was CA-31, which explains the “1” in the rank column. Monitoring open seats is important because incumbents so rarely lose: In the post-World War II era, 92% of House incumbents who ran for reelection won another term. We favor a party takeover in just three of the 12 seats: CA-31, which is the most Democratic seat held by any Republican; and UT-4 and NC-7, which, respectively, are the first and third-most Republican districts held by Democrats. Three more of these open districts are Toss-ups: the Democratic-held NY-21 and the Republican-held IA-3 and NJ-3. The other seats on this list are all at least slightly favored to be retained by the incumbent party. A few other open seats outside of this listing could be competitive in the fall, like Republican-held AR-2 and WV-2, which are more ancestrally Democratic than Mitt Romney’s big wins would indicate. However, the Republicans’ structural advantages in this election make these seats more difficult for Democrats: They are the kind of districts that might flip in a 2006 or 2008-style scenario, which is not the environment we’re expecting this year. Ultimately, this could end up being a pretty quiet year for open seat turnover in the House. Over the last 60 years (dating back to the 1954 election), an average of 10 open House seats have changed parties in each general election. Given our current Crystal Ball ratings and outlook — we currently foresee little turnover and a small Republican gain of about five to eight seats — it would be surprising if this year’s open seat shuffle even matched that modest average, though the retirement season isn’t quite over yet. As mentioned, Rep. Petri’s (R, WI-6) retirement opens up his marginally competitive district, but this is probably not the right year for Democrats to flip it. Obama won about 46% in this district in 2012 (after very narrowly winning it in 2008), and there are only five currently Democratic House districts where Obama did worse. So this doesn’t really fit the profile of a district the Democrats could win in 2014. Petri’s district is very similar to that of another retiring Republican, the aforementioned Rep. Camp (R, MI-4). In fact, Obama’s 2012 performance in the districts was almost identical: He got 45.5% in Camp’s district and 45.8% in Petri’s. So it’s reasonable to make the same ratings change we did when Camp retired: WI-6 goes from Safe Republican to LIKELY REPUBLICAN. Democrats are hopeful that the GOP primary here will be a race to the right, with state Sen. Glenn Grothman (R) leading the way: Grothman announced his challenge to Petri right before the incumbent retired. Still, the dynamic we’ve seen in some recent Senate races — where too-conservative candidates like Todd Akin (MO) or Sharron Angle (NV) have kicked away winnable races — has not been as big a factor in House races. Candidates in Senate races tend to receive more thorough vetting than in House races, which can feature more anonymous, nationalized candidates. One example of a questionable Republican candidate who lost a very winnable race in 2012 was former Rep. Allen West (R, FL-18). West lost to now-Rep. Patrick Murphy (D, FL-18), a somewhat flawed candidate himself, and ran a couple points behind Romney, who won the district. Still, West is an imperfect comparison, because his profile didn’t prevent him from winning in the Republican wave year of 2010. Akin, Angle, et al. were not incumbents. Sure, bad House candidates get nominated all the time, but there hasn’t been a spate of them with direct Tea Party/anti-establishment ties in the last couple cycles. 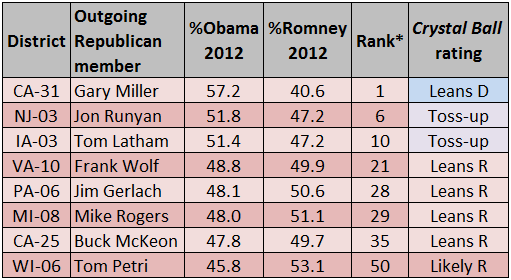 In any event, if Democrats are to win WI-6, they’ll probably need a lot of help from the eventual Republican nominee.